Make your own embroidered patches for clothing and accessories! Place the Patch Attach white side up on the wrong side of the patch. Press with a hot iron (wool setting) for 8-12 seconds. Allow to cool. 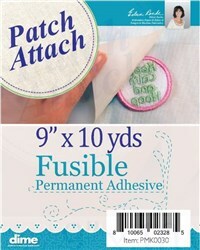 Cut the Patch Attach around the patch. Remove the white liner. Place the patch, wrong side down, on the fabric. Cover with the Teflon pressing sheet and press for 8-12 seconds. Note: DIME's Heavy Duty Water Soluble Stabilizer is not included. 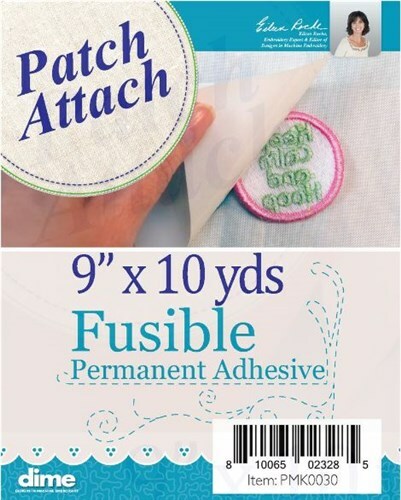 Patch Attach makes it super easy to create patches and other free standing designs!